Every Wednesday morning for Term 2, the crazy boys – Jordan, Luke, Joel, Michael & Caleb – from Pedal it Forward have been coming in to Brekky to share their adventure with Kirste and Morro. What is this adventure? Well starting on July 4, they will start their 1200km ride through Tanzania, all the way to Mt. Kilimajaro. Once there, they will hike up it! (Their poor legs). And they’re going to complete this in 21 days! They certainly are crazy, but there is more to these fellas than meets the eyes. Their riding for a great cause: fresh drinking for people who are without. They’ve partnered with a great organisation called Water for Africa, and they aim to raise $75,000 which will fund the construction of 15 fresh water wells across Tanzania. If you want to help support this fantastic cause and be a part of the adventure, you can donate here. 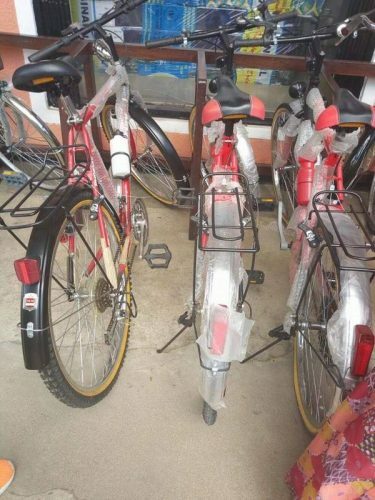 The bikes the boys will be using have already been purchased in Tanzania, and they look heavy!